STEP INTO YOUR OWN SECLUDED, LUXURY PARADISE - 3BR/3BA - 11 FOOT CEILINGS. 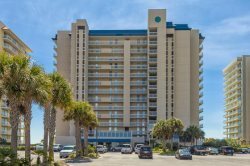 One of the most spectacular condos in Orange Beach, The Moorings, immediately next door to the NEW Playa Restaurant(Owned by Fishers at Orange Beach Marina) and Sportsman's Marina, offers solitude and time to unwind with breath-taking views of Terry Cove and Perdido Pass. OUR ZERO ENTRY POOL IS UNBELIEVEABLE - covering one acre plus of grounds. Entry into the grounds is gated and secure, allowing for more seclusion. The condo is a spacious 2000 sq. ft. There is an underground ASSIGNED PARKING SPOT just for you. Facing Southeast, there is filtered sunlight most of the day on the spacious 800 sq ft private patio. If you prefer, the beaches with sugary fine sand, dunes and sea oats are 2 miles away by car and 5 minutes away by boat. Take a stroll through the docks at Sportsman's marina to see the catches of the day OR charter a boat yourself. Better yet, catch some fish yourself off the dock and cook up your own fresh fish on the grill. Now, come inside the 1800 sq ft plus spacious condo. With exquisite new decorating, the open plan Great Room with 11 foot ceilings, eliminates the cave-like feeling of other condos. A flick of the switch gas fireplace is tucked away in the corner for cool month cozy evenings. The wet bar is fully equipped with a dedicated ice maker, sink and glasses; just supply your own wine or spirits. The Master bedroom has a king sized bed, 11 foot high ceilings with ceiling to floor windows and doors, again, overlooking the water. The Master bathroom has his/hers granite countertop vanities, a Jacuzzi whirlpool multi-person tub, stand alone shower and spacious walk in closet. The 2nd Bedroom has a Queen bed with an attached full bath. The 3rd bedroom has 2 twin beds and a private bathroom. Our beds have luxury sheets and fluffy, absorbant towels are provided. The laundry room is in the condo for your convenience with washer and dryer. The state of the art exercise room with wet and dry sauna has extended use hours. Please look at the list of activities in our area. There is an adventure for everyone. We treat this condo like our second home, not a rental; you will notice the difference compared to other condos that you may have rented previously. We know you will be pleased with your stay at our home! Fully equipped kitchen, large balcony, fire place, gas BBQ, laundry in the unit, outdoor pools and hot tub, fitness room with sauna. The owner was very pleasant over the phone and provided all the necessary information required prior to the arrival. It was easy to book and I would do it again for sure. The condo was very clean and provided the necessary essentials. We had everything we could possibly want and need. I LOVED the master bathroom! The view of the pool and the bay were relaxing and enjoyable. The kitchen provided everything necessary to enjoy meals and it was located close enough to the beach, grocery store, restaurants and shopping. We absolutely LOVED this place and cannot wait to go back!